There came a time where I just had to throw out the holey socks that I had been hanging onto. Some I’d mended a couple of times and they had worn through quickly, some the wool was so precious that I thought I would frog and make something new with the near new wool and some was just plain lethargy. 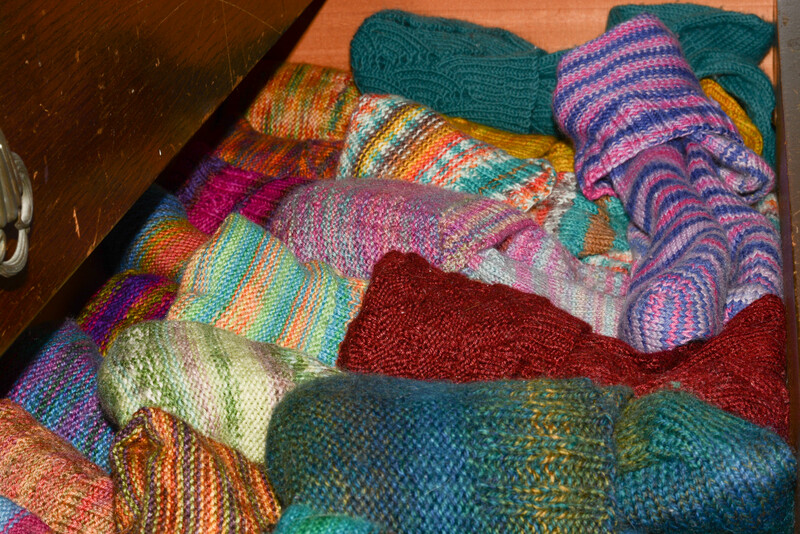 So I sorted and threw out the holey socks, being careful to throw out in pairs. Which wasn’t difficult what with both feet wearing out together. 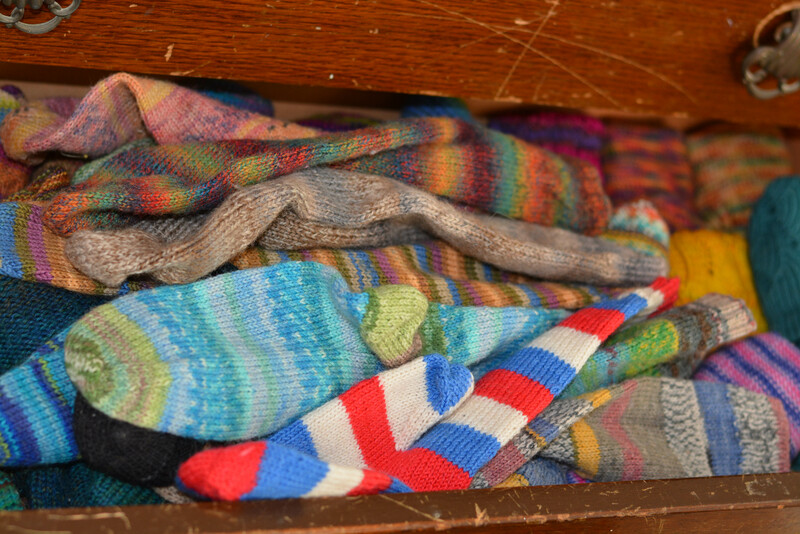 My sock draw began to look something like this. 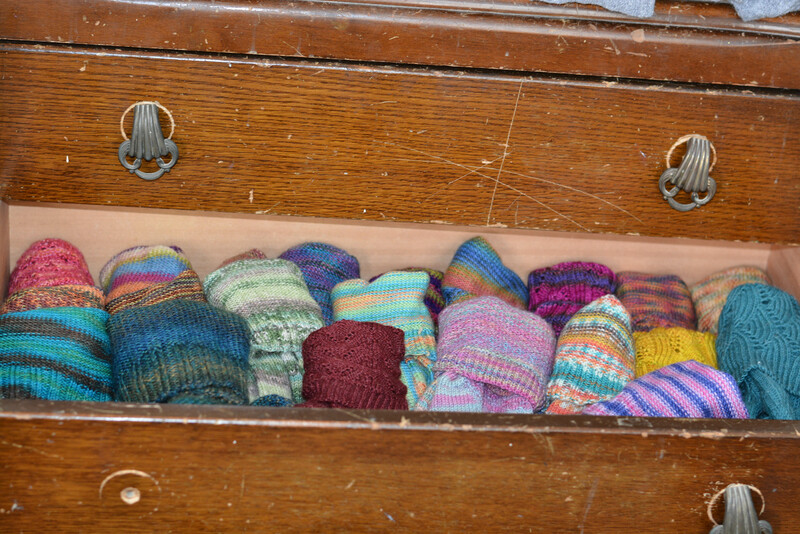 My socks are stored in a very old chest that has been in my family for many many years. My Nan bought it during her marriage, probably after she got bombed out for the second time in WWII It has lost a draw handle, and its just brown furniture which is really worth nothing, but to me, its a substantial set of draws that works well and reminds me of my nan. And one day, I’ll give it a make over, but not just yet, because all those bashes and scratches mean something to me, of how this brown piece of furniture has followed my parents, brothers and sister around depending on who needed it, in their new flat or house. Well it did, until I got hold of it and just didn’t let it go. Occasionally Mother says, ‘have you still got Nan’s drawes?’ ‘Yep’ sez I. ‘That was a good set of drawes that was’ is normally the reply. ‘Yep’ sez I. And I’ll never let it go. 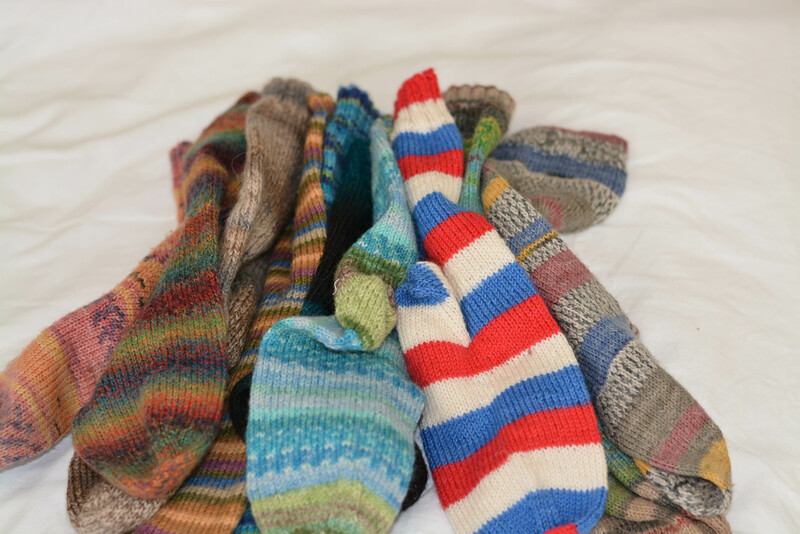 Getting back to the socks.. Lots of clean lovely socks to play with. But there was one problem, one you don’t expect when you don’t buy commercial socks anymore. In fact I was quite shocked. You see somewhere along the line, these lovely, soft, innocent, naive socks had picked up a few dirty bad habits. I’m blaming hubby’s commercial black socks, I’ve seen them joking around and leading my lovely woollen ladies astray. And led astray they have been. So the others must be at home cavorting with hubbys black socks. Naughty girls! Well I am keeping these ladies safe until I can have a sharp word with their sisters.